It’s no secret that one of the best decisions that an investor could have made over the last several decades was to own Coca-Cola (NYSE: KO) and/or PepsiCo (NYSE: PEP) shares. Between the early 1950s and the start of the millennium a $1,000 investment in each stock would have returned you close to $2,000,000. That’s equivalent to compounded annual returns of 16%. Let’s leave aside the almost mind boggling fact that this investment would now be churning out $60,000 a year in dividend income because there are two other points that I find remarkable here. The first is that those huge returns came solely from buying into the two largest beverage companies on the planet – whose brands include iconic powerhouses such Coca-Cola, Fanta, Sprite, Pepsi as well as snack brands Lay’s, Doritos and Walkers. Coca-Cola on its own is responsible for something like 3% of the planet’s beverage consumption. The second interesting point is just how similar both stocks have performed over that time frame. A $1,000 investment in Coca-Cola stock would have been worth about $1,000,000, giving a compounded annual return rate of 16% including reinvested dividends. For PepsiCo stock a $1,000 investment would have been worth nearly $900,000, giving a compounded annual return rate of 15.8% assuming that all the dividends received over the period were reinvested. What’s interesting here is that there’s pretty much no information on the starting value of either stock. It just happens to be the case that over such a long period of time the growth in both companies’ per share earnings has massively outperformed whatever the market expectations were back in the early 1950s. It reminds me a bit of the Nifty Fifty at the height of the stock market boom of the early 1970s. They would have delivered some outstanding returns despite household stocks like McDonald’s trading at over 70x their underlying earnings. It would have been tough ride, especially as some of those household stocks went on to lose up to 90% of their value in the following bear market, but overall they still would have delivered great returns despite the bloated valuations and the odd bankruptcy. It isn’t about saying that you can buy these kinds of super high-quality blue chip stocks at any price, but rather shows the importance of being on the right side of the market’s growth expectations. As it turned out even paying 70x McDonald’s exceptionally high quality earnings in the early 1970’s turned out to be on the positive side of expected value judging by the double digit annual returns an investor would have enjoyed to date. A really popular article type on Seeking Alpha is the classic “Coca-Cola v PepsiCo: Which Is The Better Investment?”. You’ve all read them, and you all know that the comments section ends up pointing towards the same conclusion. In reality when both these stocks are trading at fair valuations then it doesn’t really matter. The fact of the matter is you will probably be looking at very similar returns going forward simply because both earn tremendous amounts of profit relative to actual tangible capital required to sustain their businesses and they both operate in the same sector. You could probably Dr Pepper Snapple Group as well; the only small difference between the trio being that PepsiCo also contains a snacks division and Dr Pepper Snapple Group is largely confined to the United States. Most of the time though a long term orientated investor would be happy to purchase shares in all three of them, knowing that between them they are gaining a significant share of the world’s soft drinks market and a huge share of its earnings. At reasonable valuations you probably aren’t going to quibble too much between them. What happens though when you have two or three fairly similar businesses in terms earnings quality and future growth expectations trading at quite different valuations? This was pretty much the situation with Coca-Cola and PepsiCo in the mid-Nineties. I wrote about the experience of investing in Coca-Cola stock in those years, along with the subsequent returns, in a previous post last month, and as it turns out an investor wouldn’t have actually done too badly considering they were buying into it at valuations approaching nearly 40x earnings. A $10,000 investment in Coca-Cola shares in 1996 would have returned $28,700 assuming the dividends were left to pile up in a broker account. Now what about the case of PepsiCo? Well at the start of 1996 you could have purchased shares in PepsiCo for a split-adjusted price of $28 a share. In the prior financial year the company reported earnings of $1.10 per-share, which results in a price to earnings ratio of about 26x. It’s expensive, though still compares favorably to Coca-Cola’s value of about 35x earnings. The following twenty years would have delivered 6.6% compounded annual growth in the starting capital outlay, turning a $10,000 investment in 1996 into $36,000 worth of PepsiCo stock today. That compares to about 5.5% compounded annual returns for Coca-Cola over the same time period. 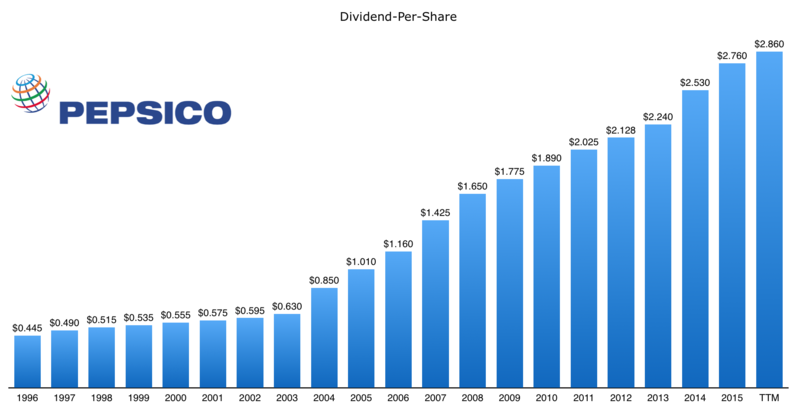 In addition you would have received $9,700 in cumulative dividends from PepsiCo over that twenty year period, which would have added a further 1.3% per year onto the compounded annual returns. If you assume that those dividends were continually reinvested into more shares then the final total return would be 9.30% for PepsiCo stock, versus 6.50% for Coca-Cola. That difference of 2.80% a year in the compounded annual returns would have added up to $22,700 over the twenty year time period. You have the same high quality businesses, but a big difference in expected value that has ended up having a fairly dramatic effect on shareholder returns. All because investors in the late 1990s were bidding up Coca-Cola stock to more extreme levels relative to its future growth prospects. What does that mean in long-term stock portfolio? You just end up allocating a bit more to PepsiCo that may otherwise have headed for Coca-Cola. When the tide turns and the ensuing crushing multiple contraction has worked its cause you end up reverting back again. It’s less about which is the better stock; more about which stock is the better value.